C. Sulpicius C.f. 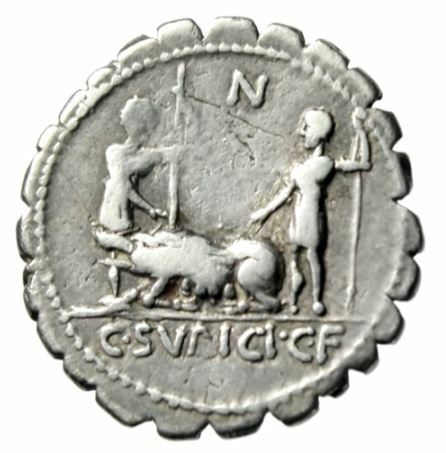 Galba was one of the moneyers for the year 106 BC. The gens Sulpicia was one of the most ancient patrician families at Rome, and produced a succession of distinguished men, from the foundation of the Republic to the imperial period. The first member of the gens who obtained the consulship was Servius Sulpicius Camerinus Cornutus, in 500 BC, only nine years after the expulsion of the Tarquins, and the last of the name who appears on the consular Fasti was Sextus Sulpicius Tertullus in AD 158.